Should you see a ki-rin in your vicinity know that somebody is about to have either a very good or very bad day. It is an agent of truth and order and spies into the minds of those around them to find evil thoughts. To those it finds worthy, it gifts clothing and items, or otherwise appears as an omen of good fortune. The ki-rin is a horse-like creatures that, despite their massive size, have such a light footsteps that they won't bend a blade of grass beneath their hooves. Doing research on this was interesting. 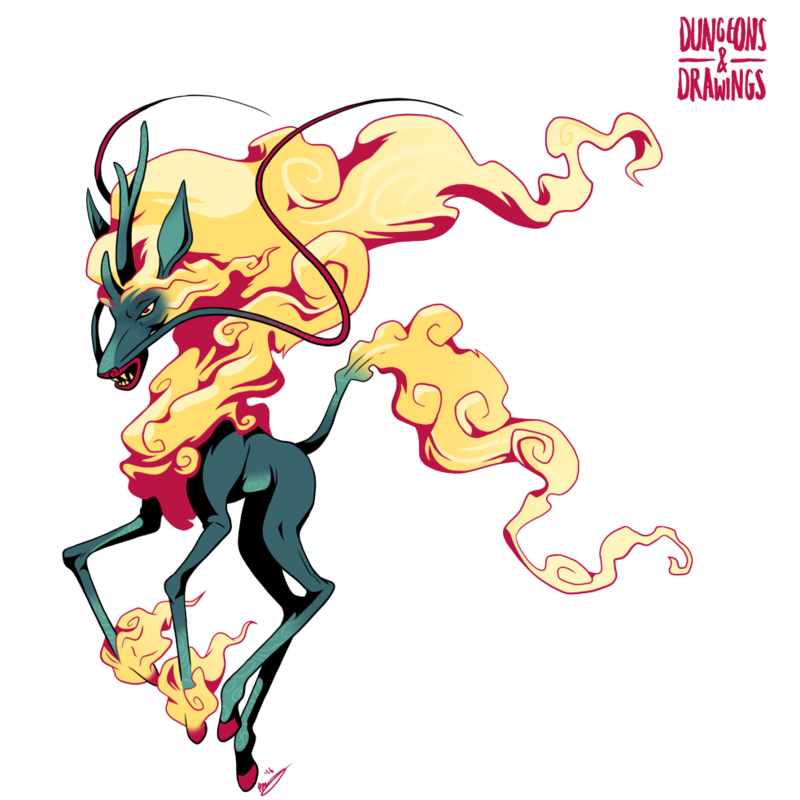 I'd been aware of the kirin/qilin creature for a while, and was well aware of how weird it is that it's called "the unicorn of the east" when most depictions of this dude show him with two. It's more common in Japan to see a kirin with one horn, but most other Asian cultures with a version of this creature go for the two-horn thing. Like a deer. Or a giraffe. Which is actually what the creature is based on, actually. Some Chinese bigwig centuries ago got a giraffe as a gift and was all like, this means I'm super important, and lots of weird iterations later we get the horse-deer-dragon-cloud thing that the qilin appears as. "Kirin" is actually the Japanese word for giraffe, kinda how "baku" is the word for tapir. Ki-rin's horn is inspired by this funky little mutant deer skull thing. Oh nature, you goof up sometimes. Correction: While giraffes and kirin/qilin are closely associated, the mythological creature is likely not based on the other. The earliest mention of a qilin is in 5th century BC China, while a real giraffe was brought to China in the 15th century (i.e. about 2000 years later) by the explorer Zheng He. While it’s possible that the original qilin was based on an ancient giraffe sighting by some other explorer or visitor to China, there is no actual record of this being the case. The Yellow Emperor (from the 2500s BC) supposedly had some qilins, but since he’s more of a King Arthur type legendary figure, we should take that with a grain of salt. Special thanks to @unikirin for spotting my mistake.